When it comes to the health and appearance of your smile, there are few things that give a person more confidence than a beautifully straight set of teeth. Some people are naturally bestowed with perfectly aligned teeth, but for those who have structural problems, such as an over or underbite, crossbite, or overcrowding, some help is necessary. To assist our patients with dental structural issues, the doctors and experienced staff at Canyon Creek Family Dentistry offer Invisalign. Call us today here in Richardson for more information. Invisalign is a discreet and effective alternative to traditional metal braces. With Invisalign, after careful analysis and the correction of any cavities and surgical needs, one of our dentists will create a clear, strong plastic device that fits over the teeth. The device will be periodically upgraded to continue the realignment of the teeth. 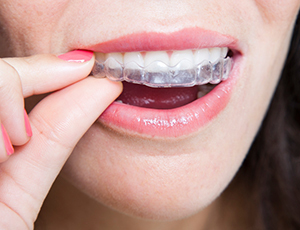 Many patients find the Invisalign appliance more comfortable than conventional braces. Since the device is removable, Invisalign patients are able to simply take out the device for eating and routine dental hygiene. This means a patient isn’t forced to avoid sticky or hard foods as they are with braces. It also means that a patient can more easily ensure good dental hygiene because they don’t have to brush and floss around hardware.